Buffalo chicken meatloaf is a great twist on classic meatloaf, using the flavors of Buffalo chicken wings in a hearty and easy entree recipe. When I made it, the internal temperature was 172F at 70 minutes; but the meatloaf was still wonderfully moist and creamy. 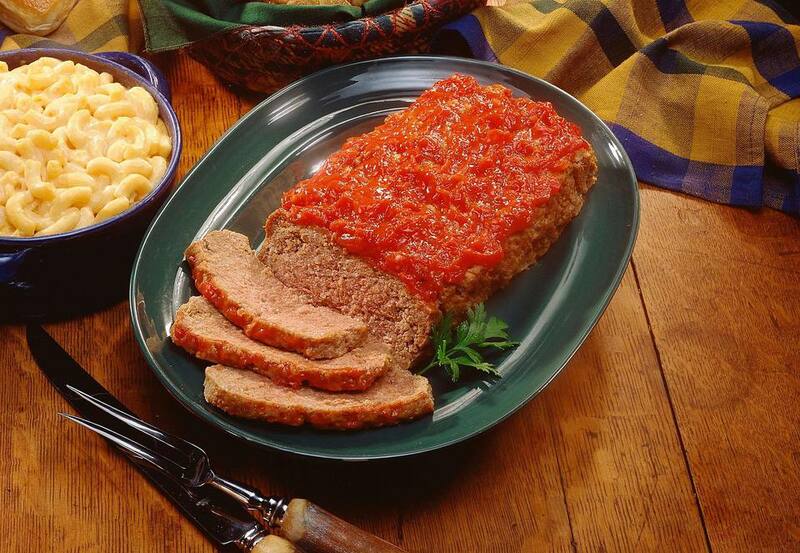 The trick to making a moist meatloaf, especially when using a low-fat product such as ground chicken, is to add lots of other ingredients. The vegetables, bread crumbs, salad dressing, and hot wing sauce all add moisture and keep the chicken from becoming too compact. Still, be sure to mix the mixture gently using your hands. Never use a spoon to beat meatloaf after the meat is added, and shape the loaf gently on the baking pan.use a spoon to beat meatloaf after the meat is added, and shape the loaf gently on the baking pan. Serve this wonderful recipe with buffalo mashed potatoes and peas and carrots.) You could add a crisp and cool green salad if you'd like for a cooling contrast. Use the leftovers in Buffalo Chicken Penne Bake for another marvelous meal! 1. Preheat the oven to 350F. Spray a slotted oven broiler pan with nonstick cooking spray and set aside. Or put a wire rack in a baking pan with sides. 2. In a large skillet, melt the butter over medium heat. Add the onion and garlic; cook and stir until crisp-tender, about 5 minutes. Add the celery to the skillet; cook and stir for 2-3 minutes longer. Remove the skillet from the heat. 3. In a large bowl, combine the eggs, bread crumbs, 1/4 cup hot sauce, salad dressing, salt, pepper, cayenne pepper, and blue cheese; mix well. Add vegetables and mix well. Add ground chicken and mix gently but thoroughly with your hands until combined. 4. Form the chicken mixture into a large meatloaf on the prepared broiler pan. 5. In a small bowl, combine 2 tablespoons hot sauce, ketchup, and honey; blend well and brush over meatloaf. 6. Bake for 65 to 75 minutes until internal temperature reaches 165F. 7. Cover with foil and let stand 10 minutes. Then slice to serve.